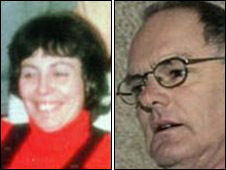 "Lady in the Lake" killer Gordon Park has died after being found unconscious in his prison cell on his 66th birthday. Park was convicted of the murder of his wife Carol in 2005, nearly 30 years after he killed her and dumped her body in Coniston Water in the Lake District. He was found in his cell at HMP Garth, Leyland, Lancashire, on Monday. BBC Home Affairs correspondent Danny Shaw said it was thought a ligature was involved, and it was self inflicted. He said it appeared he could have taken his own life. The Prisons and Probation Ombudsman will be conducting an investigation into the death. Park's son, Jeremy, who campaigned to prove his father's innocence, said he was "devastated" by his father's death. He said: "We are all completely devastated and still believe his innocence 100%." A Prison Service spokesman said Park was found unconscious in his cell at 0800 GMT on Monday. He said: "Staff and paramedics attended but Mr Park was pronounced dead at 9.40am." Sources indicated that Park had not been assessed as at risk of committing suicide. Gordon Park, from Leece in Barrow, Cumbria, was jailed for life and told he must serve at least 15 years. During a 10-week trial at Manchester Crown Court, a jury heard that Park bludgeoned his wife to death with an ice axe and dumped her weighted body in Coniston Water in July 1976. He claimed she had vanished from their home to live with another man, before her body was found 21 years later by an amateur diver. Park always maintained his innocence and in 2008 lost a bid to challenge his conviction. Park had wanted to call fresh expert testimony relating to the geological evidence given at his trial. Mrs Park was dubbed the Lady in the Lake by detectives, after the Raymond Chandler crime novel of the same name.